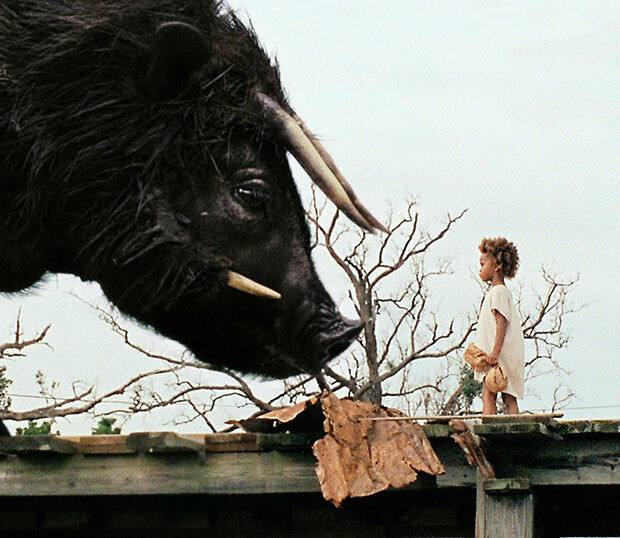 Hailed by critics as daring and original, Beasts of the Southern Wild is more like a collage of influences. Director Benh Zeitlin filters an obvious love of Southern literature (a little Twain here, a little Faulkner there) through a narrative and visual style indebted to Terrence Malick. As an Alabama native, currently working on a book on Malick, I assumed that I would love this film. Yet, for the bulk of its running time, I found Beasts of the Southern Wild tough going. Zeitlin’s Louisiana is a place of woozy mythology, not of concrete people, and this tendency renders his characters puzzling at best, inscrutable at worst. Instead of admiring the noble poverty of the inhabitants of the “Bathtub” — a village literally sinking into the brackish waters of the bayou — I found myself distracted by mundane questions: do they have jobs? how are they getting gas in their ramshackle trailers? where does all that beer come from? That Zeitlin seems uninterested in such issues suggests a strong commitment to his aesthetic, albeit one that comes at the viewer’s expense. Nevertheless, during its last half-hour, Beasts of the Southern Wild crystallizes its narrative and, in the process, casts its allegorical themes into sharper relief. At the center of the action is Hushpuppy (Quvenzhané Wallis, in a performance that garnered her an Oscar nomination), a five-year-old girl, who braves the hazards of life in the Bathtub with her father, Wink (Dwight Henry). Oscillating between booze-fueled ferocity and tenderhearted concern, Wink is burdened with a secret: he is dying of an unnamed disease. Indeed, everything around him is dying: residents are fleeing the Bathtub in the face of rising sea-levels, and an entire way of life is in peril. But this is, as the film makes clear, a Darwinian world. The living replace the dying; the strong replace the weak. Just as, in ancient days, great beasts dominated the earth, so might they do so again in an era of climate change. Zeitlin is not afraid to make this more than a metaphor: a herd of mighty aurochs (imagined as immense feral pigs) have been released from melting ice caps, and they loom in the background of the story — an ultimate menace on top of the host of others bearing down on the bayou. In such an environment, Wink is determined to toughen up Hushpuppy. He calls her “man” and “boss,” and he demands that she eat with her bare hands. She is a wild child, fit for a wild world. Only in this way can she survive. But Zeitlin does not want to end on this note. For, amid such brutality, something strange and unique emerges: the profound bond between father and daughter. It is here that Beasts of the Southern Wild touches on Christian theology. For Zeitlin, as for Christian thought, the world cannot be reduced to the barbarity of nature. There is something else, something more, in the relation between Hushpuppy and Wink. This is love — a love that not only distinguishes them from the wild, but elevates them above it. Zeitlin illuminates this point in the film’s climactic scene. As the aurochs barrel toward the Bathtub, threatening her bedridden father, Hushpuppy stands before them, unwilling to let them pass. That the beasts relent is a victory, not over the limitations of nature (Wink does, eventually, die), but over its savagery, its inhumanity. As Hushpuppy’s closing narration implies, love is the legacy of human beings. It is the thing that bestows human identity, the thing that conquers the beasts around us.